I think vapor is best w/o stripes. I considered stripes for a long time... but all they do is take away from the beautiful paint . IF you do stripes, ghost stripes would be the way to go. Well many of you will know what I'm going to say. Vapor with blue stripes. I was going to get a silver car originally and put blue stripes on so I researched this a lot. You will need a brighter blue to make it work. Wow, thanks a lot. Looks like you did do some research. I love the blue, but I think silver would be a nice clean look. Clean, mean, and classy at the same time. Blue would be more aggrevive looking all the time (not a bad thing) but not sure if what I am looking for. How about Alloy Gray? My friend has Aolly Gray 07, with Cervini's C-500 kit. He was going to put down silver stripes, I suggested he use the Vapor. He did a test panel and tada, he now has Vapor stripes on the Alloy. So I'm thinking Alloy would look great on your Vapor. what was your final choice? What I did with my vapor silver is put matte black stripes on it. This is all the picture I have of the mustang at the moment. 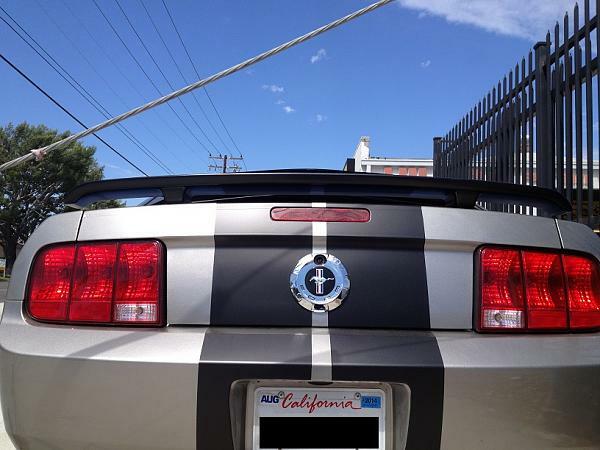 See if the you might like the matte black stripes. If you're interested I can take some better shots tomorrow and post it up.